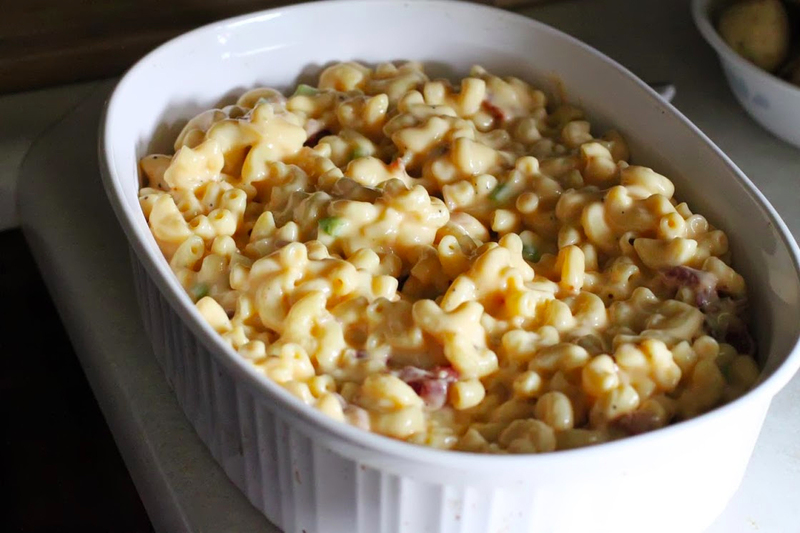 I’m crazy about a good mac and cheese, and as I have been making a variety for the past handful of years, I think we all decided that this bacon and jalapeno mac and cheese might just be the winner. Not too long ago I was teaching my boys how to smoke ribs, and as they were finished, well at least for the smoking portion, I decided that we all needed a couple of side dishes to pass along during the rib feast. I decided to make not only this awesome mac and cheese recipe, but also smashed potatoes as I knew my oldest, and possibly youngest, would not make an attempt at the mac and cheese. You realize I have a picky eater that doesn’t like mac and cheese? Yep, I have one. 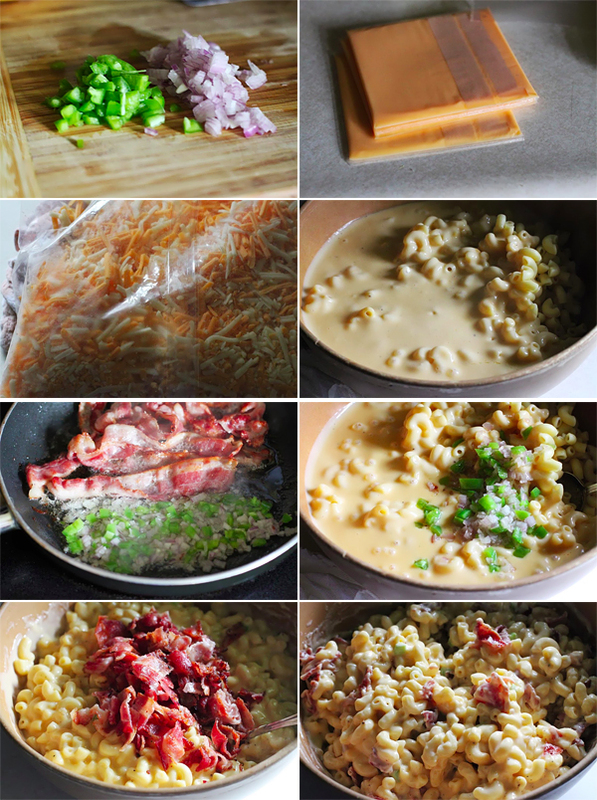 As I began making the mother sauce for the mac and cheese, that is when I decided that I was going to throw in some jalapeno peppers, and well, plenty of bacon. This was both of a favorite of my wife and myself, and I’m certain that if you love mac and cheese, you will really love this one. Start by cooking your pasta, according to the directions, but cook it just before al dente as the sauce will continue cooking the pasta when we add it. Drain and place in a mixing bowl. Cook your bacon. Towards the end, I lightly softened the diced shallot and jalapeno, just to soften it just a bit. I removed with a slotted spoon before adding it to the mac and cheese. Next, let’s make the sauce. To a saucepan, add the butter, and bring this to a medium heat, cooking the butter, just before it browns. Add in the flour, and stir with a whisk or wooden spoon to incorporate the flour into the butter. Continue cooking, and as importantly stirring for several minutes to cook out the flour. Next, slowly add in the milk, and continue to stir, breaking up the flour into the milk. This will take about 10 minutes. Be sure that your sauce has no clumps. Continue stirring until the sauce thickens. This is the start of the sauce. Once the sauce has thickened, and you will know when it has thickened, add in the American cheese slices, a couple at a time. Continue stirring. Good workout for your arm, right? Add a couple of more cheese slices when the others have melted, and repeat until all of the American cheese is incorporated. Slowly add in the colby jack cheese, stirring to melt that as well. Go slow otherwise you will notice the cheese will clump up, and well, that is no good. Pour the sauce over the pasta. Add in the shallots and jalapeno. Season with a pinch of salt, along with the pepper. Add in the cooked and crumbled bacon, and give that a good stir. Taste, and season with any additional salt and pepper according to your palette. Now you have a couple of options here. You can bake it off in a 350 degree oven for about 20 minutes, or leave it as is. I left it as it. As I normally bake it off for those crispy edges, I refrained, and were we glad I refrained. This mac and cheese was dynamite! It was creamy, not spicy, but well balanced with the crispy bacon and the awesome flavor of the jalapeno and shallot. We loved it, and as so much where we simply ate it as the main course the following evening during a busy schedule with the kids. If you are looking for an awesome, creamy style mac and cheese with a great punch, give this one a shot. It’s sure to please. Next, let's make the sauce. To a saucepan, add the butter, and bring this to a medium heat, cooking the butter, just before it browns. Add in the flour, and stir with a whisk or wooden spoon to incorporate the flour into the butter. Continue cooking, and as importantly stirring for several minutes to cook out the flour. This mac and cheese was dynamite! It was creamy, not spicy, but well balanced with the crispy bacon and the awesome flavor of the jalapeno and shallot.